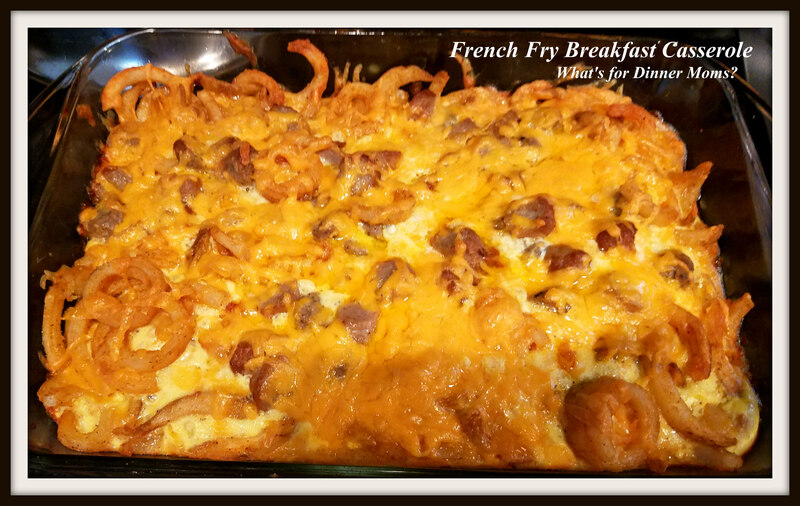 French Fry Breakfast Casserole – What's for Dinner Moms? This is to use up the few last remaining pieces from our basket for No Buy January! Remember I said at the end of the month if I had anything left in my freezer I put it in a basket and had to use it by the end of next week. So, the zesty curly French fries and breakfast sausages were perfect to use in this. No, potatoes or frozen hash browns? I had french fries! This was great. It mixed up and was ready in about 30 minutes. If you use the rolled raw sausage it will take a bit longer because you will need to cook it and cut it before adding it to the casserole. But, the heat and serve worked fine for us. My daughter only asked that next time I make it I try it with bacon. Why of course I will! 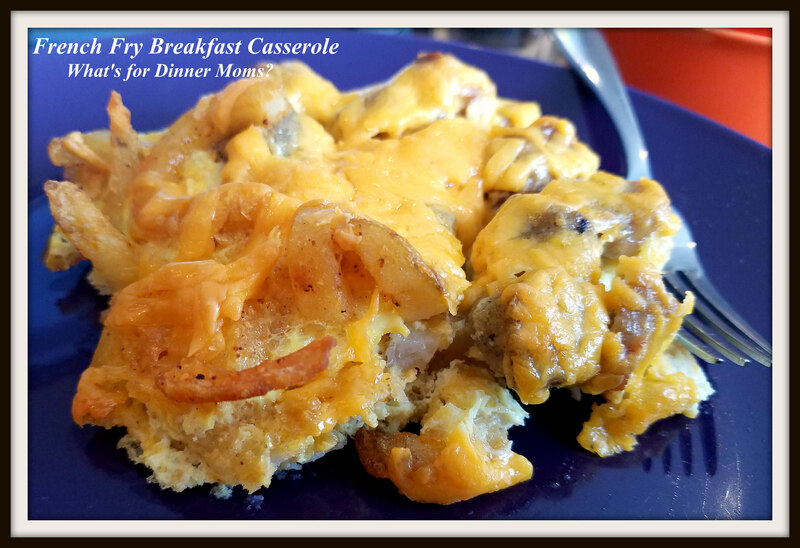 Serve this with a nice fruit and berry salad for breakfast or dinner and you will have a perfectly simple meal! Microwave heat and serve breakfast sausages for about 10-15 seconds, just long enough so that you can easily cut them into pieces. Beat eggs, milk, dried mustard, salt, and black pepper together in a bowl. Place french fries in the bottom of a 13 x 9 casserole dish that has been sprayed with non-stick spray. Sprinkle the slices of sausage over the top of the french fries. Pour the egg mixture over the fries and sausages. Finally, sprinkle the top with the shredded cheese. Bake for 20 minutes or until top is browning and center of eggs has set. Remove pan from oven and allow to set for 3-5 minutes before serving. Can’t really go wrong with spuds! Nice way to shop the freezer. Yum! I would eat this up! A great breakfast buffet mashup! What temp should the oven be on for the casserole? It says 20 min cook time but I could not find at which temperature?